Today we’ve decided to finally do a measurement to see how much power does a Bitmain AntMiner S1 Bitcoin ASIC use both at idle (not mining), at stock 180 GHS and at overclocked 200 GHS mode. We’ve been using Bitmain AntMiner S1 miner for a while now and have already shared our best settings for overclocking AntMiner S1 to 200 GHS as well as some very interesting thermal images that what gets hot and how hot actually gets on the AntMiner S1 board. 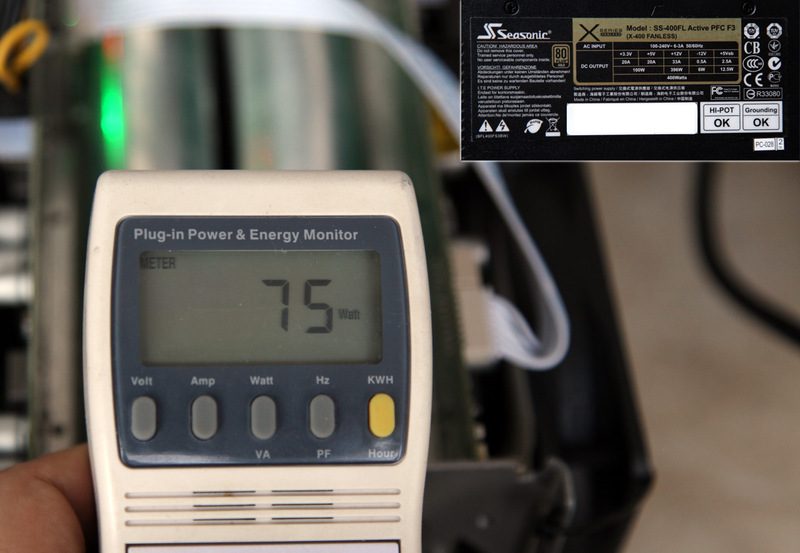 We are going to be measuring the power consumption (at the power socket) with the help of a very good 80 Plus Gold certified Power Supply (Seasonic SS-400FL) that is able to deliver about 90% efficiency at maximum load. 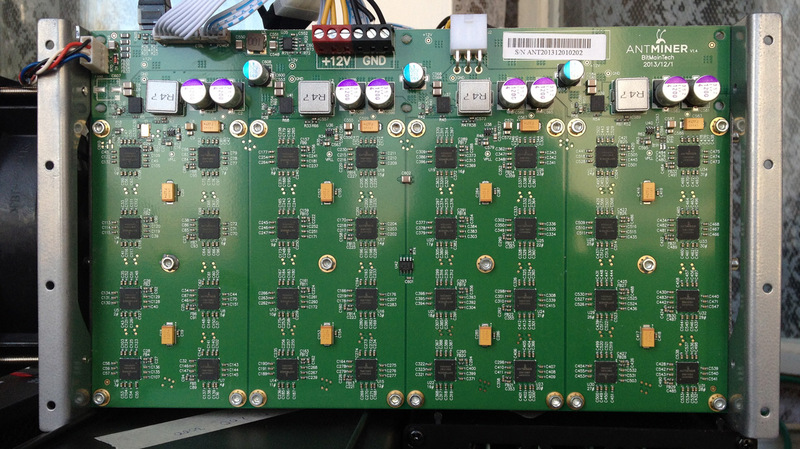 This means that the actual power usage of the ASIC miner is 10% less than what our measuring device shows and the other 10% of power are being lost during the conversion essentially in the form of heat dissipated by the PSU. What you are paying for is the actual power measured by the device we are using for the tests of the power consumption. The idle power we have measured was 75W (67.5W + 7.5W). This is the power usage that you can expect from the device as soon as you power up the AntMiner S1, it takes some time to start up and to connect to the Internet in order to get work from the pool and the power usage during that time is about 75W. Also should your ASIC miner loose connection to the Internet or the pool it is configured to mine at gets down and there is no backup or the other pools are also not available the device will consume 75W of power doing essentially nothing. What you will be more interested in though is the power usage of the Bitmain AntMiner S1 ASIC when it is working and mining for Bitcoions. At the default frequency of 375 MHz of the Bitmain chips used in this device and a hashrate of about 180 GHs you can expect a power consumption of about 407W (366.3W + 40.7W). 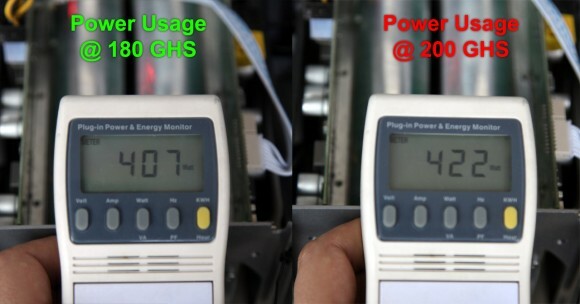 And if you overclock the device to 393.75 MHz as per our guide here you are going to be getting 20 GHS more hashrate at the cost of a small increase in power usage. In 200 GHS overclocked operating mode Bitmain AntMiner S1 ASIC will use about 422W (379.8W + 42.2W). So if you haven’t overclocked your Antiner S1 yet, then you should and our overclocking guide will ensure you get low HW error rate, lower power consumption and stable 200 GHS of hashing performance.